Salameh on the other hand said that Lebanon’s priority for 2013 is maintaining the stability of the Lebanese Pound’s exchange rate versus the US Dollar. 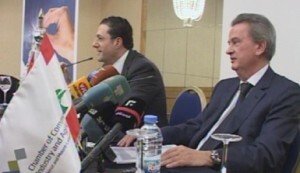 The agreement on the establishment of the (Faro) fund for Lebanon was signed in Paris on May, 20, 2011. This was based on the Union for the Mediterranean’s plan to support innovative SMEs wishing to grow in the Mediterranean. The agreement was signed by Choucair, the French Director General of the Ministry of Finance, Alain Bifani and the president of the Berytech Incubator, Maroun Chammas. Lebanon was the second country after France to establish a FARO fund. The goal is to develop this programme in different countries around the Mediterranean to create a “Network of Faro” and to support innovation and entrepreneurship in this region.